Alesia GP Course is a fictional circuit I made that is losely based on the Alès en Cévennes Speed Circuit. It is meant to replace my original track Ales GP Course 1.10. However this is a fresh location directory so you can keep the old version if you like as well as this version. heavily critisized for their inaccuracies and usually over fidilly little things. Ales GP Course is a hybrid between a real world course and a fictional course. The basic track map is the same, however I added a chicane half way along the back straight after the kink to slow down the cars a bit and make it more challenging. To my knowledge the real Ales is relatively flat. I made this version with a steep first corner climb and added my own chicane. There were many layouts to the real Ales, and I have only outlined the short course at turn 2 (not for use though). I don't plan on updating or modifying this track further unless someone would like me to. The circuit is 4.003km and consists of long curved corners that can be taken in 3rd and 4th gears (F1-1991 historical). As well as 3 long straights with only minor kinks and chicanes that barely slow down the vehicles. Ales GP a high speed circuit. F1-1991, 1988, 1993 & 1979. 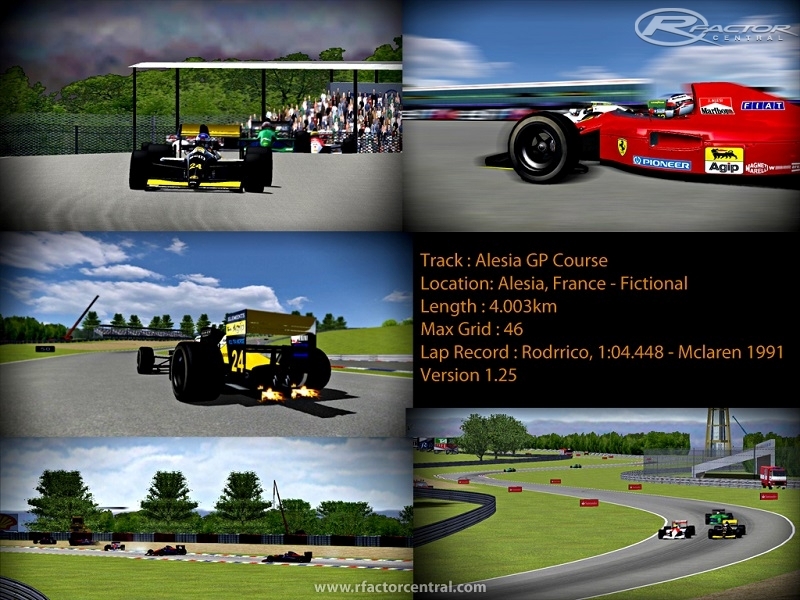 There are currently no setups for Alesia GP Course. Add a Setup.